Where is the Community Orchard? If you walk past the Community Centre and along right to the end of MacNaughton Crescent, you come to a gate that takes you into a grassed area with a tarmac track running around the edge and goal posts at either end. The orchard is at the far end of the pitch, furthest from the gate. ​Inspired by the taste of freshly squeezed apples all picked from trees in the village last October, a group of us got together to see if we could establish a Community Orchard......with fruit trees that are grown, looked after and the fruit harvested by the community. We found a great but neglected site right in the middle of the village which is surrounded by very healthy looking apple trees in neighbouring gardens; so we thought it should be a good location for more! Working with the Community Company we were successful in getting a grant from the Scottish Salmon Company, a local employer, which was enough to buy 12 fruit trees. These included 8 apples, 2 pears and 2 plums. Then the local estate (Shielbridge) said they could pay for the fencing that was needed to keep the deer out of the site. 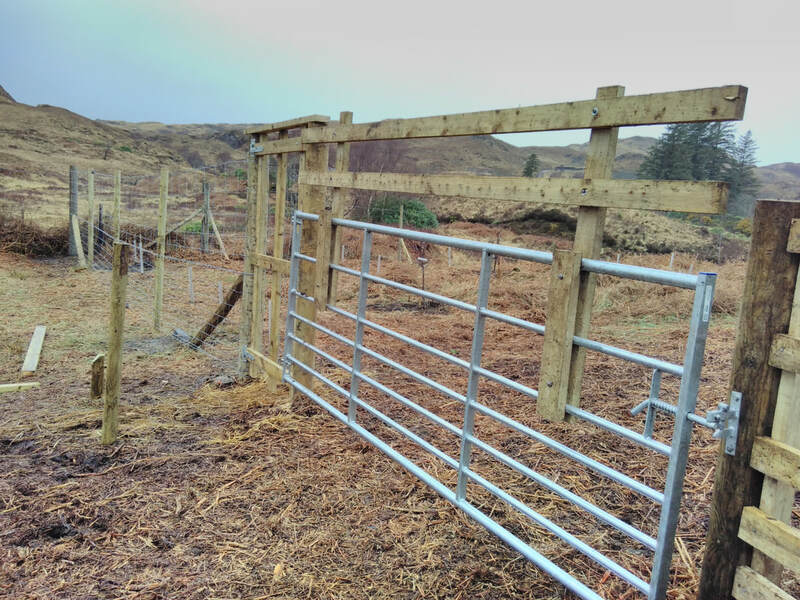 Over 2 Saturdays, we have worked with volunteers to enclose the site with new fencing, a large gate and a pedestrian gate. Up to being planted, the trees were looked after over the winter in a polytunnel and so needed to be planted out before first signs of growth. Luckily, the Acharacle Primary School sent out 12 willing pupils on March 21st and all the trees were planted, fed and staked (using coppiced hazel poles and old bike inner tubes to tie the trees to each stake). Also, unknown to all of us, the school kindly donated 40 mixed native shrubs and trees which have also been planted within the site. We are hoping the youngsters will come back at regular intervals to keep an eye on their trees and to help maintain the whole site for everyone's benefit!